You may or may not be aware that the concept of 200+ ranking signals is obsolete. Few serious SEOs believe in it. There’s a big fork sticking out of it. This article explores in detail why many of those 200+ signals do not matter and then I show you what does matter. What has replaced those 200+ ranking signals may surprise you. The concept of 200 ranking signals have been with us more or less since 2006. But Google’s algorithm has undergone massive changes during that time. The fact that Google’s algorithms have radically changed over the past ten years underlines the understanding that many of the ranking factors traditionally associated with the 200+ ranking signals have become obsolete as actionable SEO best practices. So let’s examine what truly must be search marketing best practices. Most of the keyword related ranking factors have very little to zero to do with Google. Google was founded as a reaction against keyword based algorithms by incorporating links as a signal of authority and it has been moving away from keywords ever since. Every algorithm improvement moved Google away from dependence on keywords, improvements such as phrases based indexing. The Hummingbird update was meant to bring more natural language processing power to Google search and it represents a major turning point in how search engines understand content and return answers to search queries. If you’re still worrying about H1 tags and Title tags, you may wish to consider a keyword strategy refresh. Don’t take my word for it, do a search on Google for any number of valid real-world search phrases. However don’t base your strategy on made up phrases or partial phrases as those will turn up quirky results (more on Google Quirk Results in another article). Do some real-world searches and see how often the keyword phrases show up in the title tags, in the H1 tags (or how often heading tags are not used at all! ), and don’t forget to check how often the phrases themselves are used within the content. The search engine results pages (SERPs) speak for themselves. Title tags, H1 tags, and the presence of the keywords themselves don’t always seem to be a factor in what’s ranked in Google’s top ten. While it’s still a good practice to make the meaning of a web document as clear as possible, many of the keyword related ranking signals are obsolete. It’s been said that we should be thinking in terms of topics and it sounds like a logical idea but it’s often the same old strategy of seeding a page with keywords and synonyms. Topic Keyword Strategy sounds logical but it has zero to do with how a search engine works. Here’s a link to my Keyword Research article on SearchEngineJournal.com. It’s a comprehensive review of keywords. But I will outline some of the key takeaways of what a keyword strategy is. Choose keywords based on the their relationship to the sales funnel. The biggest mistakes marketers make is to choose keyword and topics according to traffic instead of researching what the intent is behind those phrases. Many high traffic phrases have little to no value for sales. Some keywords are distantly related to sales but relate closer to building awareness. Some consider this optional but I consider these kinds of phrases to be critical. Building awareness of your site creates familiarity and trust. They might not buy today or tomorrow but when the need arises there will already be a built-in trust for your site. Furthermore, awareness building allows your business to detach itself from dependency on Google and build your own funnel of traffic, independent of Google. The essence of SEO is making it easy for search engines to understand your content. Do your keyword research, build your site architecture in a way that’s meaningful to users, create pages that solve a users problems. The sites in the top ten are not there because they have the most links. Nor do they rank number one because they have the best quality content or the highest quality links. The top ranking sites are there because Google knows why people search and sometimes this means there are different user intents, different meanings to a search query. A search query could be topical and related to current events, it can change depending on geography, a search query can simultaneously have commercial intent as well as a strictly non-commercial how-to meaning to it. Here’s the important part: Google will rank the most popular user intent first, followed by the next popular user intents. So if your web page is about a less popular user intent, it’s quite possible you may never rank at the top, no matter how many links you acquire, no matter how hard you try. Gary Illyes recently confirmed that Google does not use “overall domain authority” ranking metrics. A site may have a large amount of inbound links and that might make it authoritative for something like it’s domain name or the product it produces, but those links do not confer a domain level authority. If domain level authority existed, this would cause that high PageRank site to rank for thousands of phrases for which it might not actually be authoritative. In fact, it was approximately around 2002-2003 that such a PageRank bias existed that caused large sites to rank for phrases that they were not authoritative for. When a single factor causes a site to rank for phrases it shouldn’t rank for, that’s called a bias and it causes user dissatisfaction because searchers have to go back and reformulate their search queries. Thus, almost since the invention of PageRank, Google has been whittling away at the influence of links ever since. High PageRank links no longer cause an excessive amount of ranking influence. No longer a ranking factor. Run of site links, links from every page of a website don’t cause a site to have a jump in PageRank. No longer a ranking factor. Links in widgets from thousands of sites don’t affect rankings. No longer a ranking factor. Links in proximity to words such as Sponsors no longer count. No longer a ranking factor. These are just a few examples of how Google stopped the influence of links in order to prevent a domain bias in the SERPs. Gary Illyes’ recent comment shines a spotlight on how mistaken it is to base business decisions on a non-existent domain authority concept (read Domain Authority Does Not Exist). Using flawed information to make business decisions is neither logical nor wise. Do Domain Level Link Features Exist? Similarly, domain level link features are also obsolete. Domain Level Link Features haven’t been a factor since 2003 to 2004. Back then, SEO best practices was to build links to the home page so that PageRank would filter down to the rest of the site and power the rankings. The home page was the one that SEOs wanted to rank for their strongest phrase, with the second level pages ranking for the three word phrases, and the third level pages (three clicks away from the home page) ranking for four word and longer phrases, also known as longtail phrases. This method of building a site is an SEO strategy created in 2002 . Modern link graphs can get even more granular, so that rather from web page to web page, link graphs can be mapped from part of a web page to a part of another web page (called Block Level Link Analysis). That’s nothing new, it’s technology from 2004! But let’s stop here and consider how outdated the concept of domain level link features is. Since Google ranks sites on a page by page basis, then it only makes sense to build links on a page by page basis. I believe that building links to the second level category pages continues to be important but the days of hammering links to the home page are over. That’s not how search engines rank websites anymore. Google is focused on ranking web pages that directly answer a user’s search queries, not on ranking the pages with the most links. That’s why Google has introduced on-page factors such as natural language processing to understand web pages as well as on-page spam algorithms such as Panda to weed out highly linked web pages that are spam. There are also algorithms that look at personalization features such as your location in order to further rearrange the SERPs beyond what the regular ranking algorithm would otherwise rank. In fact, there are even algorithms that study click through rates (CTR) in order to determine what kinds of sites tend to satisfy users for search queries with multiple meanings. Thus, if the majority of searchers mean X when they search for XYZ, Google will rank sites about X above sites that are about Y or Z. This means that even though sites about Y and Z might have more links, they will never rank at the top of the SERPs because that’s not what users are looking for. Search Query Popularity… a Ranking Factor? Google is arguably a popularity engine now. This is the direct result of Google focusing search results on satisfying users. Ever do searches and feel that the results aren’t expert enough, that the information is on a 101 level? That’s because for that particular query it’s possible that more people are satisfied by 101 level answers than they are with an expert answer. One cannot put this in a box and put a bow on it and call it part of the two hundred plus ranking signals. Something like search query popularity doesn’t even make it to the annual ranking factor lists. In my opinion, search query popularity is an important ranking factor. I believe it is a ranking factor because Google’s goal is to satisfy users and allowing a site to rank at number one that does not satisfy user intent will cause many users to be dissatisfied. Thus, when creating content it is important that user intent research happen. One way to do this is to take a look at what sites are currently ranking. They’re not ranking because they’re a dot edu or a big brand or because they have the most links. Those sites are ranking there because they satisfy the user intent. Study the search engine results pages (SERPs) and understand what the user intent is. Then and only then begin the rest of your content marketing. The concept of 200+ ranking factors is naïve and has no basis in the reality of how search engines work. It is your duty as a search marketer to discard useless information and work with what is real and actionable. 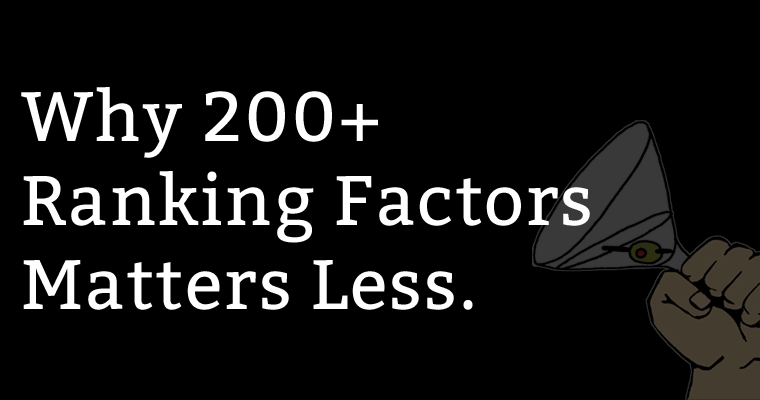 Almost everything that has been associated with the 200+ ranking factors are obsolete. Fairy tales are for children. It’s time to grow up and move on to real SEO. Contact me if you need help with your search engine marketing.